This, of course, was a problem because that small regional jet represented that last flight out of Chattanooga and it was December 23 and the next day was Christmas Eve and some of us wanted to get home, right? Mike Burnop and I had broadcast a basketball game between Virginia Tech and Chattanooga several hours earlier and Ed Corbett had served as one of the game’s officials. We were three of maybe seven people who were ready to board a plane that … well … wasn’t going to go anywhere that night. As that gate agent delivered the tough news, the three of us looked at each other, glanced at the now lonely plane, back to the agent who began shutting things down for the night and then back at each other. Hopeless. We were stranded. In Chattanooga. At 8 pm. On December 23. “Let’s rent a car and drive,” Mike suggested. So the three of us lugged our bags past the already-closed snack bar and to the rental car area. “How long of a drive to Blacksburg?” I asked. We thought maybe 5-hours in good weather, but longer in this fog we surmised. “How long to Yonkers?” Ed asked. Yonkers? As in New York? Ed lives in Yonkers but had relatives in Pennsylvania. He suggested he could make it in 12 hours. Maybe. We arrived at the Avis counter – the other companies were all shut down for the weekend -- but we soon learned more bad news. “All I have left is a truck,” the Avis rep said. That wasn’t going to work. We needed two cars. This was a disaster. But Ed had a suggestion: The three of us would pile into the front seat of the pickup truck and drive to Blacksburg. “I’ll drop you guys off, and then head up the rest of the way,” Ed suggested. After tapping on his computer for a while, he did come up with a car. “That’s fine,” Ed said. “But I’ll take the truck. Although he had the much longer drive, Ed insisted Burnop and I take the car. We walked out of the airport to the lot and began our respective drives- The broadcasters back to Virginia and the referee back to New York. In the coming months and years, every time Ed would work one of our games, he’d come over to the broadcast position. We’d all get a chuckle and the players, coaches and other media members would all wonder what the heck were we all laughing about. Ed Corbett, with his son, Ed Corbett, Jr.
Ed is a giving, caring, hard-working guy who battled knee injuries over the last few years, but was still one of the best and most highly respected officials in the country. Ask any coach about Eddie and they’ll tell you how well he calls a game. 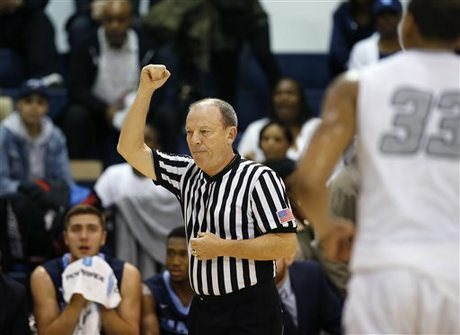 His son, Ed Corbett, Jr. is also an NCAA official who will be working games for years to come. He’s in the family business and following one of the greats. Ed worked 26 NCAA Tournaments, 6 Final Fours, and 4 NCAA Championship games. That’s one tremendous career. Tonight, however, Ed works his final game. The NIT game at Madison Square Garden will be cap his brilliant career. As for post game? No flight. No rental counter. No truck. From MSG to Yonkers? That’s the shortest trip of his amazing career. He’ll ice his knees, take a shower, hop on the Hudson Parkway and be home in 30 minutes. It's "Last call" for Ed Corbett. And we should all toast to one of the finest NCAA officials ever.